It was only after taking a closer look at this photo taken Friday of her two kids paddle-boarding on Manhattan Beach, California, that June Emerson realized that the pair had not been alone among the waves that day. Much to her surprise, just a few feet away from where the children were playing, the silhouette of a sizable shark can be seen in the surf. "It was quite a shock to see" June tells KTLA 5 News. 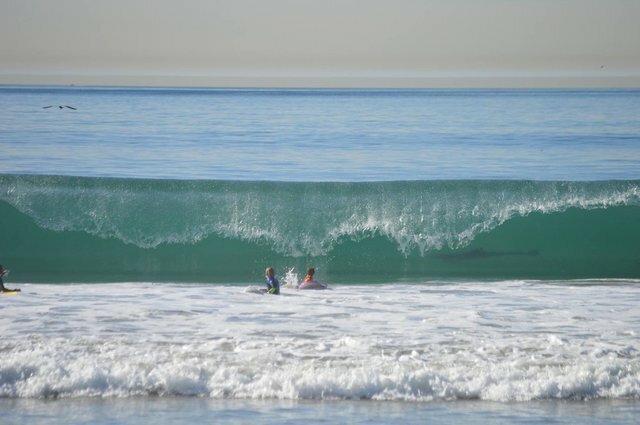 "Many local surfers and lifeguards have seen this and believe it to be a shark. Of course, I told my kids it was dolphin, as we live at the beach and are in the waters here almost daily." Although the mere sighting of a shark is enough to send most swimmers dashing back to shore, chances are that close encounters like this occur quite often - unseen and ending without incident. Even in waters frequented by sharks, like those in Southern California, attacks on humans are exceedingly rare, resulting in just 10 fatalities in the state's history. UPDATE: According to CBS LA, some biologists have noted that the animal in the photo above could actually be a dolphin, not a shark. "The great thing about science is it's always great for us to disagree," says Dave Bader, scientists with the Aquarium of the Pacific. "And, you know, it's hard to always be absolutely certain. Certainly from that picture, if you look at it from a distance, it looks like it's either one."